With the aid of local activists, Animal Equality’s investigators have infiltrated the Chinese dog and cat fur industry across several regions of the country. They uncovered the cruelty behind the killing of dogs and cats for their fur in the fourth investigation Animal Equality has carried out into the Chinese dog and cat fur and meat industry. Animal Equality’s investigators, with the assistance of local activists, have infiltrated the Chinese dog and cat fur industry. Conditions in several regions across the country were documented over a number of weeks. At a dog farm in Jining, Shandong, animals were photographed being warehoused in small kennels, bordered by sharp, rusty metal pens. Dogs lived on uneven and filthy concrete or wooden floors with little more than a scoopful of straw for bedding. Some of the animals had infections and injuries. At the Dali Market in Nanhai district, Foshan, also in the Guangdong province, dogs and cats were filmed being recklessly unloaded from trucks as they struggle inside the cages. No care is given if the animals suffer or obtain broken or fractured bones, only their meat and fur matters. Most of these animals are stolen from families and at this, and similar markets, the dogs and cats are sold to slaughterhouses and restaurants. 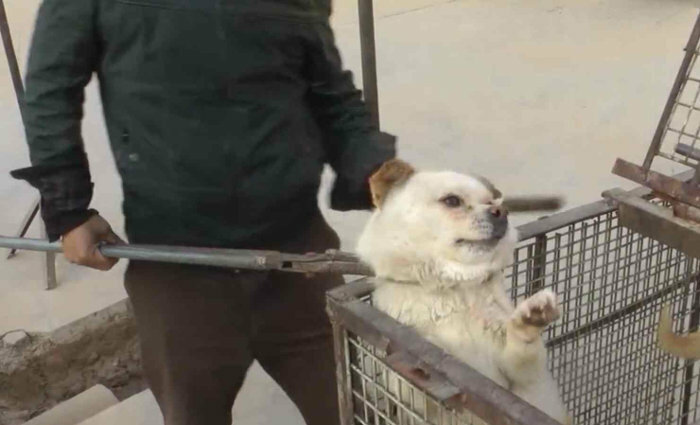 Two facilities in Jiaxing, Shandong province, were documented killing and skinning dogs, where the animals’ deaths are brutal and agonising. Dogs and cats are given blows to the head to render them unconscious, their throats are then slit. Many recover consciousness whilst bleeding to death. Dog and cat fur is used to manufacture bags, toys and clothes. At a market in Guangzhou in the Southern China province of Guangdong, Animal Equality investigators discovered merchants selling carpets made of dog and cat fur – some of them from as many as nine or more animals – and a shop in Beijing which sells children’s clothes made from cat fur. This is the fourth investigation Animal Equality, with the help of Chinese activists, has carried out into the Chinese dog and cat fur and meat industry to help end the cruel trade. Animal Equality has achieved the closure of 33 dog and cat markets and a slaughterhouse. Vita – one of the dogs found trembling and pleading for help at a slaughterhouse – was also smuggled out by investigators. She is now in good health and soon after became a mom, giving birth to eight healthy puppies who play safely away from the horrors of the slaughterhouse. ← VICTORY! A Dog Slaughterhouse and 33 Markets shutdown!